At Barrow Systems, we pride ourselves in making Refrigeration Systems that not just saves money, but safeguards the lives of the operators. 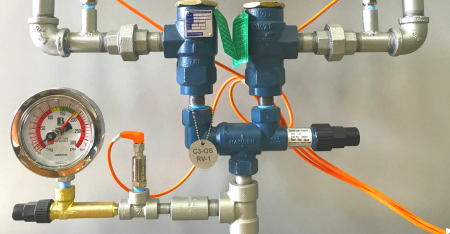 Our patented Refrigeration Relief Valve Monitoring System © (RRVMRS) detects abnormal pressures of ammonia before you know it yourself. The abnormal pressure detection in any pressure vessel and “Early Bird” alarm to attract the attention of the operator is a highlighted feature of the RRVMRS. With real-time detection, our system minimizes downtime and helps the operator address potential high-pressure conditions before they become a problem. Elevated pressures trigger the system alarm to alert relevant personnel. A preventative measure this way solves the problem before the pressure relief valve is lifted. Every pressure location is displayed on an HMI screen. The data captured during a release event includes not just the time and date, but also the exact location and quantity of the release. Regardless of the time of day, the relief system continues to monitor and report the status of the refrigeration systems vessels. This leaves your safety to us while increasing your productivity. Barrow Systems is uniquely suited to offer the best custom refrigeration design services for clients across the United States. We are committed to flawless execution and delivery, and we take pride in helping our customers thrive in today's challenging environment of regulations. Thank you for your interest in Barrow Systems! Please contact us using the information below. For additional information on our services, please call us today. Keep up to date with our blog and connect with us on social media. © 2017 Barrow Systems, Inc.